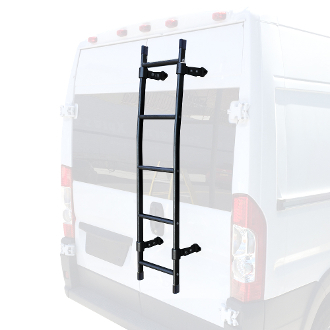 56" Aluminum Angled Rear Door Ladder for Mid Sized and Full Sized Standard Roof Vans. Available in black, white or silver finish. Ladder attaches securely and easily with supplied hardware. Available in white, black or silver finish. Ladder is secured with 5/16" bolts and 1" washers with nylon locking nuts. Drilling required. Please allow 2-3 days for shipping and an additional 1-5 business days for delivery to most US locations.